The MSD Cap-A-Dapt adapts a large Ford-style cap onto most MSD Billet and Pro-Billet Distributors. This large cap spaces the spark plug terminals farther apart which lessens the chance of crossfire and ionization occurring. Spark plug-type terminals provide tight connections that will not vibrate loose. Rotors are injection molded out of Rynite for incredible strength and resistance to spark. Incorporated thick vanes stir air even more for additional ionization prevention. 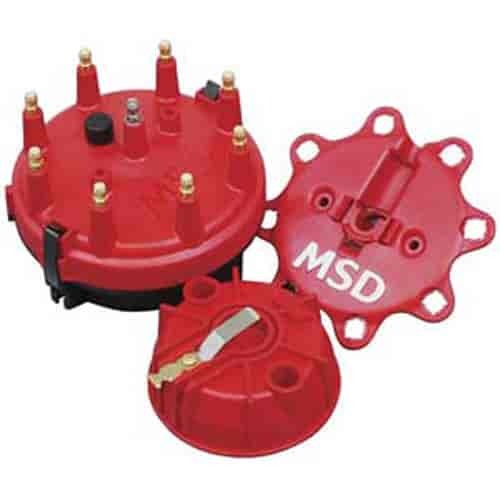 MSD distributor caps and rotors are designed with performance in mind and molded from high-quality, voltage-insulating material with terminals that resist carbon tracking. Whenever the distributor cap is changed, you should install a new rotor. Likewise, if you're replacing the rotor, be sure to install a new cap as well. MSD has new kits featuring Rynite injection molded distributor caps and retainers to complete your distributor tune-up. MSD also has Cap-A-Dapts to fit large Ford-style caps onto MSD distributors.